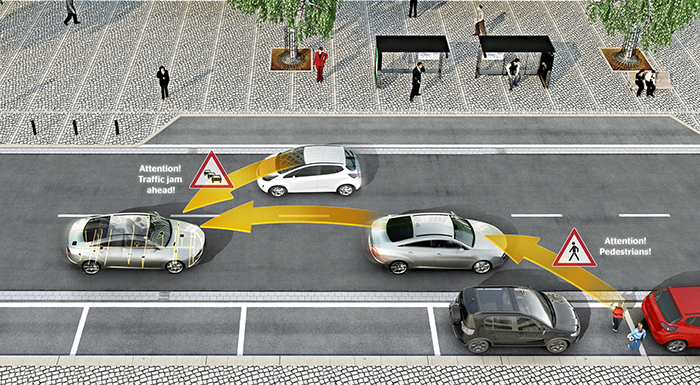 In its target to boost the safety of vulnerable road users (VRU), Continental never stops developing new technologies. Thanks to Vehicle-to-X (V2X) communication, vehicles are now able to communicate with these road users. Short-range communication such as WLANp enables the exchange of position data to prevent possible collisions or considerably reduce the severity of accident. Dr. Bernhard Klumpp, Head of the Passive Safety & Sensorics business unit at Continental, said in a statement that protecting vulnerable road users such as cyclists and pedestrians is one of the biggest challenges on the road to accident-free driving. He added that short-range communication could also play a decisive role here and bring them one step closer to their target of zero traffic casualties. A vehicle featuring V2X technology is capable of communicating with VRUs carrying a special transponder or smartphone. Advanced vehicle-to-vehicle and vehicle-to-infrastructure communication is based on a standard for direct ad-hoc communication (WLANp). In the future, it will be possible to integrate a smartphone into this ad-hoc communications so that they can communicate with vehicles that use V2X. Smartphones of today are already WLAN communication-capable. A few tweaks to the communication chip will help smartphones to be adapted to exchange V2X messages with vehicles through WLANp. Dr. Gunnar Jürgens, Head of Development in the Passive Safety & Sensorics business unit, and Managing Director of Continental Safety Engineering GmbH in Alzenau, Germany, explained that it is mainly crucial to ensure that the high standard of data security and functional reliability of V2X technology is implemented when extended to communication with smartphones. The movement predictions and position of the VRU are transmitted anonymously to the vehicle using V2X messages. Plus, incoming messages are validated and processed within less than 0.1 seconds. The higher-level control unit in the vehicle determines whether the driver should be alerted or if an intervention in the vehicle dynamics is required. Given that the GPS-based localization of a pedestrian is not accurate enough, the focus in succeeding designs is on improved concepts for relative localization and movement prediction. Also, data fusion with data from other on-board sensors will be applied prior to potentially engaging the brakes. This can conclusively enhance object recognition and classification. One huge benefit of short-range communication, with a range of 300 to 500 meters, is the extremely low latency time. This is crucial for exchanging safety-related information, such as the vehicle dynamics, position and brake operation. In accordance with Germany’s Federal Statistics Office, about 50 percent of people killed in traffic accidents are VRUs such as pedestrians, cyclists and motorcyclists. Between 2000 and 2012, the number of deadly accidents involving car passengers dropped 50 percent. The 2014 annual report of the Organization for Economic Co-operation and Development (OECD) also reports that the same statistic for VRUs plunged by less than 30 percent over the same period. The V2X technology promises to prevent more accidents, specifically those involving VRUs.